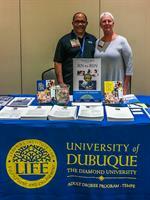 Founded in 1852, The University of Dubuque-Tempe is the first Iowa based learning institution located out its state. While the main campus host 2,100 younger student annually, this remote program is called LIFE for “Learning Institution for Fulfillment and Engagement” and focused on learning adults 23-yrs and older. The college’s LIFE model is a Christian-based, non-profit, and is regionally accredited through the Higher Learning Commission, bring together first-time and transfer students needing to complete their degree, at a very affordable tuition cost.